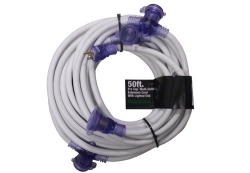 Suitable for both indoor and outdoor use, this 50 foot long extension cord by Celina is made from a heavy duty material that will last through almost any kind of weather. It is water and flame resistant and includes a 40 degree cold weather jacket to add further protection. Other features include a six multi outlet with 10 foot spacing and a lighted end. Keep your equipment running from long distances with this sturdy extension cord.